Finally, proper bike parking at Barkly Square. 20 bikes can now park right at the front door, in 2 (ex) car bays. Click this link for a picture of the rails being installed this morning. The initiative is a partnership between Moreland Council and Barkly Square management. Council convinced them to give it a trial and loaned them our temporary/event parking rails on the condition that they were installed as close to the door as possible. We agreed to conduct surveys to show that they would be well used, that the economic return would be better than if just 2 cars parked there and that there would be no, or a lot less, bike parking opportunistically and cluttering up their entrance or trampling the garden beds. And they had to take away the “Please don’t park your bikes here” banners. Barkly Square are interested in your feedback, so take a minute to ‘Like’ them on Facebook. They agreed they will supply the bike parking at the end of the trial if it is successful. So this might be an opportunity to convince them to put in the deluxe, roofed, model if they get a good response via social media. 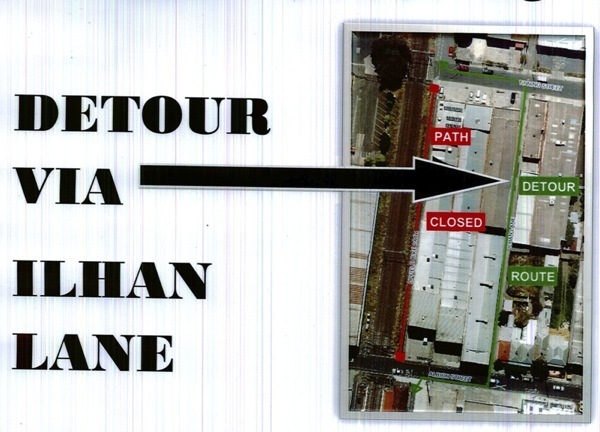 Note that the Upfield Path will be closed between Tinning and Albion Streets in Brunswick on Mon 27 to Wed 29 May 2013 inclusive, between 9am & 3:30 pm. 12 lights are being mounted on the wall for users convenience and safety at night. The above dates may vary, depending on weather. Please be aware that works on the wall abutting the bike path are required as part of the renovations to the Brunswick Baths. The path will NOT be closed but will be narrowed on the wall side so that cyclists going in opposite directions will not be able to cycle past each other. The sections of closure are short (around 10m) and works will only occur between the morning and evening peaks; and not every day (e.g. outside painting is weather dependent). Please stop and/or give way if necessary and exercise patience and care. There may be short delays; it may be an inconvenience; so allow extra time for your journey if you have a deadline to meet. If you have any questions or problems, please email or call Nicholas Elliot (p: 9240 1294), or Gordon Blake, Traffic Engineer (p: 9240 1155). Just a quick note to let you know that the De Chene Reserve Bridge that was damaged in the Xmas Day flash flood, has been reopened for pedestrians and cyclists. Cross with Care. The damaged hand rail will be repaired on Monday (Jan 23rd) – until then barricade tape has been placed across the gap. The other bridge that was damaged, in the Edgars Creek park land near Ronald Street, will remain closed until it has been repaired. Repairs will start next week. Have you ever had a bike nicked? Would you like to get your bike engraved to make sure it doesn’t happen to you? Do you know there are some simple changes you can make that will to dramatically reduce your chances of being a victim of bike theft? Come along to the Find My Bike Fun Day! As part of the day’s activities, police from the Brunswick and Fawkner Stations will attempt match people who’ve recently lost their bike to theft with the stolen bikes they’ve successfully recovered. If you’ve lost a bike bring some ID and details of the bike and you may be reunited with your beloved steed. The Brunswick Cycling Club will be putting on a sausage sizzle and providing tips on riding in a velodrome. Police will also be engraving bikes on the day. Get your bike engraved and deter that would-be thief. There will be lots of fun on the day – including fun for the kids with a special appearance from Constable T Bear. This event is presented by the Victoria Police working in association with the Brunswick Cycling Club and Moreland Council . Brunswick Velodrome is on the Merri Creek Trail, just north of CERES – road access is via Harrison Street – Melway 30 B5. If you would like more information about the event, please contact Simon Stainsby, Sustainable Transport Officer Moreland Council sstainsby@moreland.vic.gov.au or phone: 9240 1168. This weekend marks the end of daylight savings. It will be getting darker earlier, which means your ride home from work will soon be in twilight or at night. When the clocks go back, its time to put the bike lights on. This weekend is an ideal time to do a quick check to see if you are ready to ride at night. Do you have front and back lights? Are they still bright after they’ve been on for a few minutes? – An LED light with flat batteries will start out bright but quickly fade. To meet road rules for riding at night your bike will need to have bright front and rear light visible from 200m and a rear reflector. If your bike lights aren’t up to scratch and new batteries don’t do the trick … its time to pop into your local bike shop and get some new lights. To make it easy, Moreland City Council, in partnership with Avanti Superstore (Brunswick), Lygon Cycles, Rays Bicycles (Brunswick), Commuter Cycles, and Velo Cycles is offering you a huge 20% off selected bike lights during the month of April in the ‘Clocks Back, Lights On” bike lights promotion. Simply print out the attached voucher and take it to a participating bike shop to claim your discount. It’s also a good idea to wear bright clothing when you ride to make it easier for other road users to see you. I keep a hi-viz vest in my pannier and pop it on over my day clothes when I ride home, but there are many more stylish options. When you’re at the bike shop have a look at the range of fashionable reflective wristbands or trouser cuffs. send them to the committee (committee@lists.morelandbug.org) or come to the next meeting where we will be discussing the Strategy. The next meeting, which will be the last BUG meeting for this year, will be on Thursday 25 November at the Edinburgh Castle Hotel (681 Sydney Road, Brunswick – in the back meeting room). The meeting starts at 7.30 pm and will finish around 9.00 pm. Food and drinks can be purchased there and members and guests are welcome!